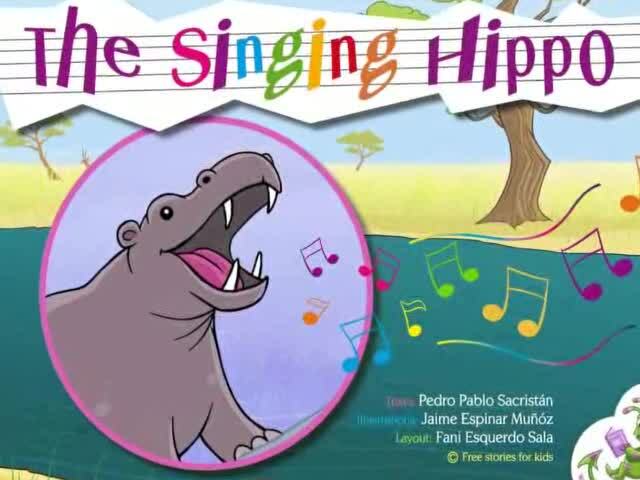 The Singing Hippo. Short animated story narrated in American English. Once upon a time, a hippopotamus lived in a river next to a big and solitary tree. One day, a bird came and nested in the tree. The songs and the flight of the bird caused such envy in the hippo that he couldn't think of anything else. Every day he would lament the fact that he had been born a hippo. This, despite the many times the bird told the hippo he was so lucky to be so big and such a good swimmer. Finally, the hippo made his mind up that he would come out of the river, climb the tree, go out to perch on a branch, and start singing. However, when he tried to climb the tree it was all too clear that the hippo didn't have wings, nor claws to climb with, and neither could he hop. Realising that he would never manage it, he angrily rammed his whole weight against the tree until it came crashing to the ground. Then, triumphantly, he stepped onto the leaves of the fallen tree, and began singing. Unfortunately, hippos can't sing either. All that came from his mouth were horrible noises, and when the other animals heard this they all gathered round to make fun of the hippo standing on the branch of a fallen tree, trying to sing like a bird. He was so embarrassed by this that he decided to never again regret being a hippo. He also felt bad about having knocked the tree over. He used all his strength to raise the tree back up again, replant it, and look after it until it had completely recovered.